At Cardiff Commercial Window Cleaners Ltd. all our technicians are qualified, trained and experienced in the installation of Class A1 Anchor Devices ( Safety harness eyebolts) for Fall Arrest, Fall Restraint, Work Positioning and for Rope Access. All installations and testing are done in accordance with BS EN795 and BS 7883:2005. The importance of the safe installation, inspection and testing of these systems cannot be underestimated. Any faults in the system can seriously jeopardise a person’s life. The key difference between a Fall Arrest/Fall Restraint System and a Rope Access/Work Positing System is the type of usage expected. The standard of installation is the same, but the inspection period is 12 months for a Fall Arrest installations and 6 months for Rope Access installations. 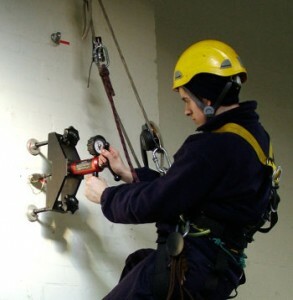 A ‘Fall Arrest’ eyebolt installation is to save the worker in the event of a fall from height on ONE occasion (after which it will be replaced in accordance with HSE and LOLER standards). 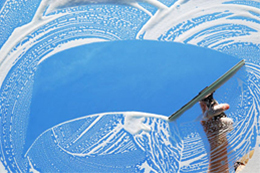 These would be used by, for example, by window cleaners accessing the window from the inside. Rope Access/Work Positioning Systems are in place for works to be carried out using ropes attached to these eyebolt systems, to enable them to carry out work, for example, painting, construction work, cleaning, etc. at height. Eyebolts can be installed directly into brickwork, concrete, masonry or steelwork. 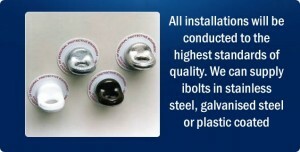 The anchor systems used for eyebolt installations will vary for each structure. The eyebolts themselves, along with the anchor systems can be made from galvanized, powder coated or stainless steel materials. Our technicians are qualified, trained and experienced installers and will make a thorough survey of the area before installation takes place and advise you of the necessary safe requirements for installations. 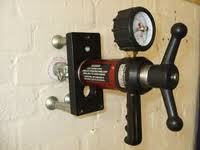 If eyebolts are already installed, periodic examination is an essential and legal requirement. If the eyebolts installed are for rope access use, they will need to be tested every 6 months. If the eyebolt system is for Fall Arrest, they must be tested every 12 months. All eyebolts should be marked in accordance to the relevant British Standards and the PPE Directives. They should have a label attached, indicating the date of the next examination, category of use and any other detail required by that category of use. You will be provided with a Certificate of Periodic Examination. Any aspects of an existing system that do not comply with the requirements, will be recorded in detail and a report issued to the clients stating which eyebolts may remain in use, and those which should be withdrawn together with reasons and recommendations for remedial action.